1. Preheat oven to 325 degrees Celsius. 2. Heat the peanut butter and butter in a microwave safe bowl in 30 second intervals until it is melted, stirring in between. Let this butter mixture cool completely before using. 3. In a medium sized bowl, mix together the flour and baking soda, set aside. 4. In a large bowl, mix together the brown sugar and sugar. Then, stir in the butter mixture. 5. Stir the eggs and vanilla into this mixture. 6. Gradually add the flour mixture to the wet mixture. 8. Roll a teaspoon full-ish amount of dough into a ball with your hands. They should be smaller than a golf ball but, not so small. Place them on an ungreased cookie sheet about 2 inches apart. 9. Bake for 15 minutes, or until the tops of the cookies begin to crack slightly. Let cook for a few minutes, then place on a cookie sheet. 10. Mix up the Peanut Butter Frosting from the recipe below, and spread in between the cookies with a knife. 2. Stir together or mix with a mixer for a few minutes to make it fluffy. Since I'm at college making these, I do not have a mixer. So, everything in this recipe I did by hand. 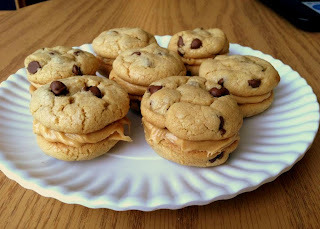 Also, I used creamy peanut butter but, will probably try it with crunchy next time. I'm sure both would be delicious. Please let me know if you try these and how they turn out!